SAN DIEGO (Scrap Monster): A previous attempt to ban single-use plastic bags in stores throughout the city of San Diego is gaining new life. City council president Sherri Lightner said she will reintroduce a municipal measure to ban disposable plastic grocery store shopping bags. Mayor Kevin Faulconer has also directed city staff to move forward with an environmental review of the ordinance, which is necessary to bring the measure to a council vote. This move comes just as plastic bag manufacturers succeeded in delaying – and perhaps ultimately defeating – the statewide plastic bag ban signed into law last year by Governor Jerry Brown. An attempt to overturn the law will appear on the November 2016 ballot, Secretary of State Alex Padilla announced Tuesday. Opponents of SB 270 needed to obtain 504,760 valid signatures from registered votes to qualify the referendum for the ballot. Provisions of SB 270 are suspended until after votes are cast in the November 2016 election. “SB 270 was never a bill about the environment. It was a backroom deal between the California Grocers Association and their union friends to scam consumers out of billions of dollars in bag fees, all under the guise of environmentalism, said Lee Califf, the executive director of the American Progressive Bag Alliance, which organized the signature-gathering drive. The American Progressive Bag Alliance represents the nation’s plastic bag manufacturers and the recycling industry. Linda Escalante, policy advocate for the Natural Resources Defense Council called the referendum “nothing more than a greedy attempt by out-of- state plastic bag makers to mislead California’s voters for their own gain. “Single-use plastic bags litter our neighborhoods and harm our rivers, lakes, coast, ocean and wildlife,” Escalante said. SB 270, signed into law by Gov. 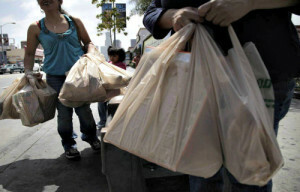 Jerry Brown on Sept. 30, would ban grocery stores and pharmacies from making single-use plastic bags available. The law would also provide up to $2 million in competitive loans to businesses transitioning to manufacturing reusable bags.